HRH Princess Maha Chakri Sirindhorn (centre), Ambassador Pisanu Suvanajata (second from right) and the Thai delegation were received by members of SKA Organisation’s Senior Leadership Team, including Director of Corporate Strategy Dr Simon Berry (fourth from right). Photographs by Howard Barlow © 2018. 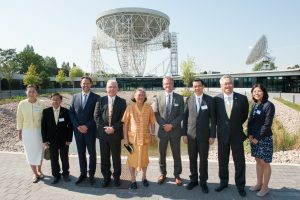 SKA Global Headquarters, 9 July 2018: The SKA Organisation (SKAO) was honoured to welcome Her Royal Highness Princess Maha Chakri Sirindhorn of Thailand to its global headquarters at Jodrell Bank in the UK last week. Her Royal Highness was greeted by SKAO Director of Corporate Strategy Dr. Simon Berry, who delivered an overview of the SKA project to the delegation. The Princess was accompanied by senior Thai officials, including H.E. Mr. Pisanu Suvanajata, Ambassador of Thailand to the United Kingdom and Dr. Saran Poshyachinda, Executive Director of the National Astronomical Research Institute of Thailand (NARIT). Thailand has seen a rapid development of its astronomical facilities since NARIT was established in 2008. The Thai National Observatory, with its 2.4m optical telescope, has been operational since 2013, and its first infrastructure in radio astronomy, the 40-metre Thai National Radio Telescope (TNRT), is currently under construction. Located in the northern Chiang Mai province and due to be completed in 2020/2021, the TNRT facility will initially study pulsars, masers and molecular lines, and NARIT plans to link it to existing international Very Long Baseline Interferometry (VLBI) networks. 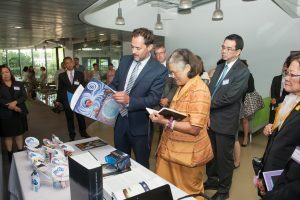 During her visit to the SKAO, the Princess was shown a range of SKA outreach materials that illustrate the project’s scope and describe its ambitious science goals, and she took a moment to try out one of the SKA’s popular virtual reality headsets. Her Royal Highness has a keen interest in technology and radio astronomy, and last year visited the FAST facility in China, currently the world’s largest non-steerable radio telescope. The Thai delegation also spent time with the SKAO’s neighbours at the Jodrell Bank Centre for Astrophysics and Jodrell Bank Discovery Centre, where Her Royal Highness was received by senior representatives from the University of Manchester, which operates the site, and given a close-up look at the iconic Lovell telescope. Her Royal Highness was shown SKA outreach materials, including a brochure on the Shared Sky indigenous art/astronomy exhibition, by Director of Communications, Outreach and Education William Garnier. Photographs by Howard Barlow © 2018.